We had some staff pictures done last week for our new About Us page. We wanted you to be able to get to know us since we work with so many people exclusively through the internet. We decided to make it a party and I broke out the Otter Pops. We really know how to party around here. Which generation are we shooting for? There has been an idea simmering in the back of my mind since the BYU Affiliates conference a couple of weeks ago that is percolating stronger and stronger as I review the blogs I've been watching this last week. Here it is, not at full boil, but perhaps it will come to a boil as I start to work it through in my blog. The people who are writing the new family history sites, and managing the old ones, are swimming in a sea of *! *!cutting edge internet technology!*! * Wikis--where anyone is invited to collaborate on writing together, Social Networking--sites like Facebook.com and MySpace where people talk to each other, blogs of course, and etc. This is great for the 20 something crowd, our college students that can text faster than they can talk and do nothing that isn't attached to the internet. But is that crowd doing genealogy? Rather than building genealogy tools to appeal to the 20 somethings, maybe we should be working on attracting the younger generation to the topic of Family History at all. I don't know that the interest is there no matter what the computer system looks like. It seems that the people I know in that age group are conditioned to a much bigger entertainment factor. And I wonder if they are going to be interested in it as they get older. All of these new and exciting social networking genealogy sites are great for the 20 somethings that don't care. And overwhelming to the older generation that does care. One lady at the South Davis conference a couple of weeks ago told me that her 70ish (?) mother left the New FamilySearch lecture in tears. Hmmm. Are we missing the boat? Allen, Paul, “In San Francisco for SnapSummit 2.0”, Paul Allen: Internet Entrepreneur, 25 March 2008, (http://www.paulallen.net/san-francisco-snapsummit-20): accessed 31 March 2008. Grace, “RIP Phone Book, 1878-20? ?”, Genealogy Insider, 26March 2008, (http://www.familytreemagazine.com/insider/PermaLink,guid,7b6d0e4c-6577-4d6d-b9cd-1e50d188b679.aspx): accessed 31 March 2008. Seaver, Randy, "Genealogy Social Networking Sites", Genea-Musings, 27 March 2008, (http://randysmusings.blogspot.com/2008/03/genealogy-social-networking-sites.html#links): accessed 31 March 2008. Michael John Neill's comments on all the excitment over political genealogy is interesting at Famous Person A is Related to Famous Person B. All the bruhaha over Obama being 9th cousins with Brad Pitt and Clinton related blah blah to Jolie was really pitiful. Pretty much everyone is your 9th cousin. If you have parents or grandparents in the old familysearch.org database Ancestral file, you can test that theory out at http://roots.cs.byu.edu/digroots/ the BYU Computer Science Department's Relationship Finder. Signed, the first cousin twice removed of Mitt Romney. I'd rather find my future partner. I have a feeling The Genealogue will usually get the nod if I post the funny blog entry of the week. See also: Beer is in his blood.--I told you so: The Magnitude is Amazing-TheChartChick.com. To comment or not to comment. After much deliberation. I have decided to add comments to this blog. Moderated--so be nice. You can't have much of a conversation, like I love at conferences, without anyone being able to talk but me. Hey, a short post! MIRACLE. I haven't posted much this week because we have been busy catching up from conferences and I have been working on finishing a large descendancy project. We have done several huge descendancy projects, last summer and then recently. Every time I am overwhelmed by the realization of how one life affects so many. I think most people don't realize how many descendants you can have in a few short generations--even if your family isn't very big. And we have no idea how the way we live our day to day life changes the lives of those around us. In one project we worked on last year, which was actually on some ancestors of my own, in 7 short generations, there was an amazing amount of posterity--numbers that you can't appreciate until you try to put it out on paper. I spent a couple of weeks working on that project, and thinking about how so many people looked up to those same ancestors, and were effected by the examples they set for us. I think I get some of my overbearing nature (good when applied right), some of my sense of humor and some of my love of scholarship from that ancestor. And many other good and bad characteristics from others. Kim and I were just talking this morning about how our parent's marriages have affected ours, for good and bad. I think there are so many things ingrained in me that I don't realize come from this ancestor or that. Our self-esteem, our world outlook, all sorts of things come from ancestors--possibly many generations up. And on the other side, you don't realize how quickly the way you use your life will affect so many descendants that come from you. 1024 great great great great great great great great grandparents. 2048 great great great great great great great great great grandparents. 2,097,152 in the 22nd generation. You can flip that upside down and, if everyone only had two children, see how many descendants you would have. Every once in a while, we have someone call and want a blank chart for 20 generations or so. If you give each person in that last generation 1/2 inch, you can see that such a chart would be about 22,000 feet tall. You just don't realize how expansive it goes until you try to put it out on paper. When you gather your family, don't forget the tape/video recorder. Here are some questions to ask around the table. What was the biggest turning point in your life? Looking back, how would you have dealt with it if you had known what you know now? How did you get your name/nickname? Is there anything you have always wanted to do and haven't? How would you describe your sense of humor? What is your all-time favorite joke? What was your all-time favorite practical joke? What was your favorite family tradition as a child? Favorite vacation? What do you think is the most important guideline that youth should follow today? How did you meet Grandma/Grandpa? What do you remember most about your courtship? How did your parents meet? What message would you like to leave your descendants? 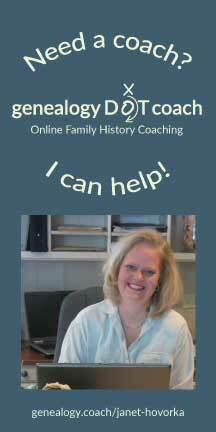 Or try the easy to use software Personal Historian. Have fun thinking up your own questions as well. And just make sure you capture the conversation for posterity. Before I quit and go back to work, I have to write a little bit about Holly Hansen, Kim Savage and Janene Morgan of My Ancestors Found. These three are modern miracle workers. Their company My Ancestors Found puts on large genealogy conferences. I don't think anyone who goes to, or shows at one of their conferences has any idea what a tremendous amount of work goes into pulling off a conference like that. But we all appreciate it. They do a wonderful job of making it fun and informative for everyone. I know they are planning on a show in Mesa AZ in November, and I am hoping there are many more in the works soon. We are done now with three straight weeks of conferences, and while I am tired, I am bummed. Conferences are way too much fun. Hope to see you at one soon. Advice for writing a blog. I took the opportunity this weekend at the Logan Family History Expo to ask a few people I admire about how to write a good blog. I am so lucky to be able to work with these great people. Dear Myrtle's Pat Richley said to "just be yourself." I appreciate her wisdom because I think that putting a blog out for the world to see makes one automatically want to arrange things in how to impress people. Sometimes I think it might not be so good to put what I'm thinking out on the internet for everyone to judge. But if that is the case, so be it. Who else am I supposed to be anyway? I'm sure you would be able to see through it if I try to fake something else. Arlene Eakle echoed Myrt's sentiments in that I needed to "find my voice." I suppose that may take a while, but I suspect in the end, it will be centered in how important I think Family History is, and how vitally important I feel it is to pass your family's history down to the rising generation. It brings a great power into your life. That is why I'm here doing this every day--for the influence it will have on my children, and for the influence it will have hopefully on yours. And while I'm sure it will be sprinkled with the research slant of my librarian background, and life running a genealogy business, I hope most of what I can do is help you center yourself, and inspire the next generation. The world needs more people who know who they are, and have the strength and fortitude to be true to themselves. Thank you Pat and Arlene for the great advice and influence you have on me. There are a couple of ways to subscribe to this blog. First: if you are using Internet Explorer 7 you'll have a little symbol like this: up in the tool bar. When you are at http://www.thechartchick.com/, that symbol will light up orange. Just click on that orange symbol, and under your favorites , in the feeds category , The Chart Chick will be there. You can also hit (Ctrl+J) and your feeds menu will show up in IE7. If you are using another blog reader, I have added several buttons to help you subscribe on the bottom right of the website. Just click the one you are using and it will walk you through the process. Simple. Personally, I like the Google Reader because it is close to my e-mail and keeps track of posts I haven't read yet. I'm new to this, if you have any troubles or other ideas on subscribing, let me know at janet@generationmaps.com. Thanks. Here are some of the things we have seen customers do with our charts over the years. 1) Track your database. We get feedback about this all the time. One customer said "I can finally see all the work I've spent all these years doing." 2) Impress the in-laws. We had one customer this Christmas write us back and tell us that her previously cold father-in-law had spoken to her for the first time in years after her gift of a chart on his ancestry and descendants. He appreciated her efforts and she was thrilled. 3) Join two families. A step family chart, or a wedding chart is a great way to celebrate the start of a new life. Below is my personal favorite chart. It is a canvas giclee wedding chart that hangs in our dining room. I enjoy how everyone is young and in love. 5) Collect information at a family reunion. I always say, and have never been proven wrong, that when you see something wrong or missing on the chart at a family reunion you have to go get a pencil. I actually went to a family reunion of my own last summer where the organizers didn't want anyone to write on the chart, they wanted you to send an e-mail. It about killed me not to add in my sister that was missing. Even your Aunt that doesn't want anyone to know her birthday will put it up on a chart. 6) Inspire yourself. I'm betting most of the people reading this blog have never been to one of my lectures. I often tell about a time 3 years ago, when I was late for an appointment and leaving town the next day, and I walked into the house to find the washing machine pipe had broken and our main floor was under 6 inches of water. The water was draining down through the furnace and our basement was about 4 inches under as well. Of course it wasn't a day when the house was clean and as I went through the house in a panic picking things up, I happened to look up on a wall where a picture chart was hanging. In it I saw my ancestors who had crossed the plains as pioneers, farmed in the desert, lived through the depression, and made all sorts of sacrifices for me. In that moment I had a peace and a perspective come over me. This wasn't a big deal in the grand scheme of things, I had insurance, it would be fine. And even though through the next two weeks they ripped out our kitchen, and recarpeted everything, my daughter was in the hospital and it was perhaps two of the worst weeks of my life, I went through it with a much greater sense of peace and gratitude. 8)Impress your kids. I want my kids to know where they came from, and the decorating in our home reflects that. The other day, when my son wouldn't finish his book report, I jokingly reminded him that he descended from the very prolific Pratt family, and he had it in him. He knew he wasn't getting out of it. Poor kid. 9)Appreciate someone. This one kind of goes with #2. We do lots of charts for anniversary parties, retirements, 80th - 90th birthdays and etc. 10) Explore a new database. Getting a file out on a chart is a great way to see what is in someone's file that you received from a databse. And with New FamilySearch, we can print any of our charts right from the database. I've got to go now. The 5 worst things to do with a chart will be coming shortly. Warning: This is a little bit of a mind dump. The night I decided to do a blog, Kim and I tossed around a bunch of names. The point--it could have been worse. I went to bed and was just about to fall asleep when it hit me. Catchy, funny, a little intriguing. Just like sweet humble me. In the spring/Easter time it works. I hope I don't hate it by this fall. I think I'll use this blog to mirror and enrich some of the articles from our newletters. If you are on our newsletter, you get a refresher--with some insights I've added. If you aren't, you can be. Start with the interesting stuff. "Rich Media," items such as pictures, videos, stories and audio are your best allies in the quest to win hearts. Do you have pictures of great-grandpa that look just like your son? 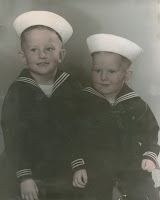 These are pictures of my husband and his brother, and my dad and his brother. You can bet I have a matching picture of my sons. Know your target audience. What kinds of things are they interested in? If your brother is interested in cars, show him what your grandfather was driving. Son interested in legos? Have him build a replica of the family home for display at the reunion. And if you have any computer or scrapbooking enthusiasts in your family, I'm sure you'll be able to come up with something. Take them with you. Share with your family the places their history began--from your childhood home, to your great-grandfather's. One of the most moving motherhood experiences I've ever had was the time I took my kids to the church and school where I lived when I was their age. It felt like time collapsed and I could see such perspective on my life. There are also many living-history sites/museums that can teach them about the time period their ancestors lived in. Have a family outing together and then tell them about the people who lived there and then. My kids and I have had a wonderful time the last two summers volunteering at the pioneer village near our home. They know how an ox team feels and works together, how to re-thread a loom, how to beat rugs, and how to give it 10 minutes until their imagination kicks back in from their plugged-in world. Surround yourself with your history. Of course Generation Maps' charts and canvas portrait giclees are a beautiful way to display what you have researched. But any way you do it, make sure your family history is out where you can see it. When your living family members see how important it is to you, they will begin to be curious about where they come from as well. Share Traditions. While many of the things you do probably have roots in the family you grew up in, make sure your family knows where those ideas came from. While you are eating Grandma's cottage cheese pancakes, tell your family about what a wonderful cook Grandma was, and how she was so patient all the time. Or when you are fixing the car, tell your child about Grandpa's innate mechanical genius that probably runs in their dna too. My mom has promised to teach my kids to make her grandmother's honey candy this weekend. They are looking forward to it. Anything sugar. The broad perspective, sense of gratitude, and feeling of being anchored that your family's history brings will be a great benefit to those around you. Best wishes for sharing what you have learned and inspiring your living loved ones. Maybe it was the vibes at the BYU conferences last week, or maybe I just like to write. I spent the Affilates Conference, the Technology Conference, and then the Computerized Genealogy Conference talking to Dear Myrtle, Leland Meitzler, the guys from Legacy/Millennia Corp, Renee Zamora, Rick Crume, getting to meet Mark Tucker, etc. With company like that, it was inevitable that I would start a blog. 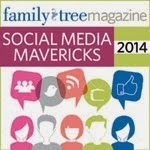 There are alot of good people writing genealogy blogs. If nothing else, this blog will give me an excuse to consistently read theirs. But I'd have to give the credit for the final push to Mike Booth and Bruce Buzbee of RootsMagic. Apparently they think I have something worth listening to. I love going to conferences and talking with all the people we get to see there. And I miss everyone when we have a break from the conferences. I want to get more active in the blogosphere so I can enjoy those conversations all the time. I love the people I get to work with in this business. Genealogists are the greatest people around. So let's start with what we do at Generation Maps. That is something I know a lot about. By way of introduction-a little advertising-because this is who I am and what our company does. And then we'll move on. Generation Maps is all about getting your genealogy off the computer screen and out where you can see what is going on in the overall picture. And we are all about making that as easy as possible. We take care of all the formatting and printing needs. You just send us any genealogy computer file and tell us how you want your chart to look, and we put it together and print it for you. 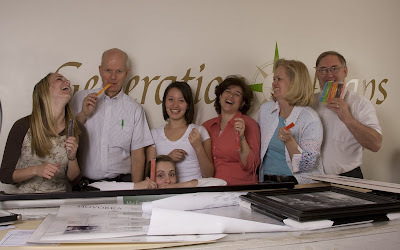 We develop your genealogy into working charts (big inexpensive family reunion type charts to write on and see the big picture with) and/or decorative charts (frame sized charts with online approval so that they are perfect on your wall.) We also print charts you create with any genealogy charting program. We print on 6 different papers in archival or non-archival inks. Any kind of chart you can dream up we can do. And in our partnership as an affiliate of the LDS church, we can also print any kind of chart out of the New FamilySearch database. http://www.generationmaps.com/nfs. More on that later.